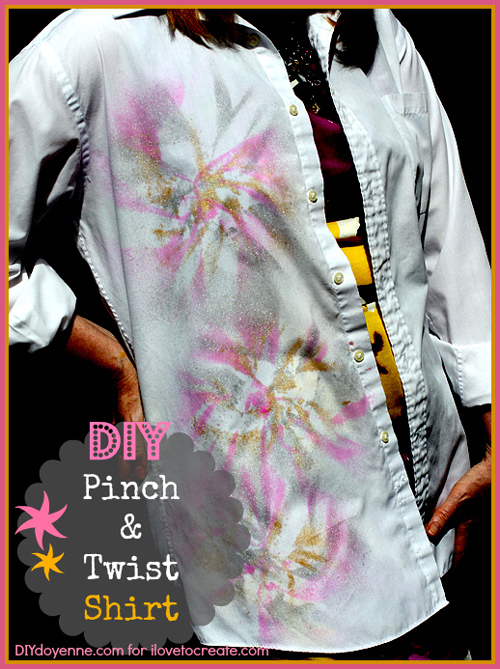 This DIY Pinch and Twist Beach Cover-up Shirt can be created in under ten minutes! As a fair skinned gal, I always cover up at the beach and often with a large men's shirt. They're comfy, cool and can be worn in the water. 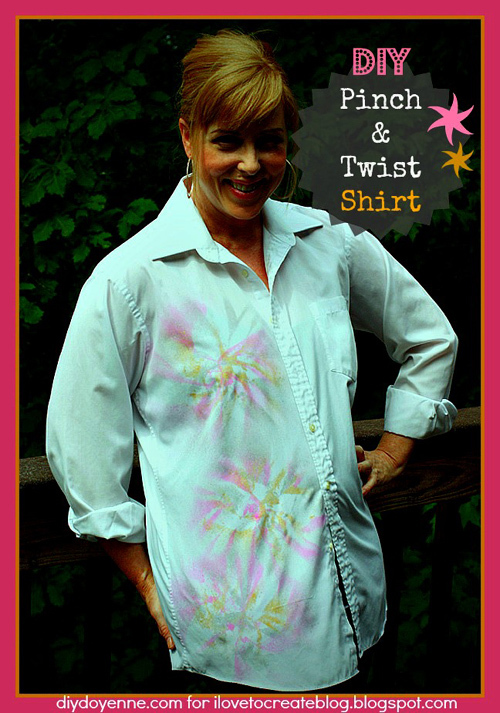 It was super easy to give this plain white shirt a little pizzazz with Tulip Fabric Spray. This is a whole new way to approach tie dye, using a spray instead of a bottle and your finger tips instead of rubber bands. 1.) Make sure your shirt is pre-washed to remove sizing. 2.) Grasp shirt in spot where you want to center your pinch and twist. Twist shirt in a clockwise direction. 3.) Hold silver spray 12" from shirt and give it a few spritzes. 4.) Repeat to make three total pinched sections. 5.) Repeat with gold spray turning your twists counter clockwise. 6.) Repeat a final time using pink spray and turning clockwise. 7.) Allow shirt to dry for 72 hours before washing and 4 hours before wearing. We'd love to see what you make with Tulip Fabric Sprays and the Pinch and Twist technique, be sure to join the iLoveToCreate.com Facebook page and share your projects with us! Visit DIYDoyenne.com for more fashion and style and DIY Doyenne TV from Margot Potter on YouTube!